L. Wayne Seiter 82, of Prospect, died Wednesday afternoon January 30, 2019 at his home surrounded by his loving family. He was born July 13, 1936 in Prospect to the late David and Velma (Almendinger) Seiter. Wayne was a 1954 graduate of the Prospect High School, where he was active in sports and FFA, he earned his State Farmer Degree. He was raised in the St. Paul’s Lutheran Church in Prospect, in later years he was a dedicated listener of WMRN Sunday morning worship from Emmanuel Lutheran Church in Marion. 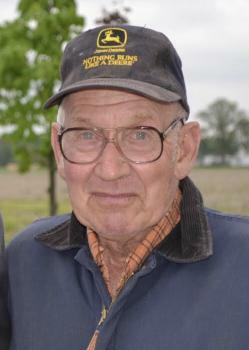 Wayne was a lifetime farmer; he loved being outside and working on his farm. This farm was a source of pride for the entire Seiter family, from all the different animals raised there to the Sunday night family dinners to all the harvests. Wayne still owned the first tractor he purchased for his farm. He was also a Rural Mail carrier for 21 years. Wayne served his community as an Elgin School Board Member for 24 years, where he was able to hand diplomas to all of his children. He was also named to the All-Ohio School Board in 1990. He had served as a 4-H advisor. Early on in his career he had worked with Johnny Long as a painter and at Whirlpool as a guard. Wayne loved sports; it was a great joy for him to watch his grandkids playing sports and showing their fair projects at the Richwood Fair. He was a big fan of Bobby Knight. Most people who knew Wayne knew that his bark was worse than his bite. He was also known to enjoy playing the lottery once in a while. On September 25, 1955 at the Richwood Church of Christ, he married Roberta “Bobbie” (Kirk) and she survives, also surviving are their children: Pam (Ben) Bumgarner of Richwood, Penne (John) Rouse of Richwood, Paula (Gary) Price of Prospect, Patty (Kyle) Stofcheck of Richwood and Robert (Cindy) Seiter of Beckley, West Virginia. I am so sorry to hear of Wayne's passing. My sympathy to your family as I know that family meant the world to him. Prayers during this difficult time. My heart and prayers go out to you all. What a wonderful man. He will be missed by so many of us! So sorry to hear of Wayne’s passing. Our thoughts and prayers are with Bobbie and all of the family. May you find peace in the Lord and all of your wonderful memories of times spent with your husband, father, grandfather and great-grandfather. So sorry to hear of the families loss. He will be missed from the fair and sporting events! Bobbie and I have been friends for 81 years. When she started to date Wayne and was getting serious I was concerned he would come between us in our friendship . He not only encouraged us but put an A/C in their upstairs so I would be comfortable when I came in the summers. He was my folks Mailman for many years. Dad became very ill and Wayne would bring the mail up to the door so Mother did not have to go out in the weather. So sorry to hear of Wayne passing. Your family has my deepest sympathy. Thinking of you Bobbie and family. Prayers. I send our sympathy to the entire family, It saddens me to think that Wayne is gone, but I don't think he would be happy if he couldn't be active. He was a good friend to me over the years. You are all in our prayers at this difficult time. So sorry for your loss. Sending prayers for all of you. I am so sorry to hear of your husband, father and grandfather’s passing. I always enjoyed visiting with him in Prospect. I was also one of many people who actually received my diploma from him. So sorry for your loss. Wayne was a great person who will be greatly missed. Bobbi and family I’m so sorry for your loss. What a great man! You are all in my thoughts and prayers. Our sincere sympathy to the Seiter Family on the passing of Wayne. May he Rest in Peace and may those left behind find comfort in the precious memories you share. Seiter family: we are so sorry to hear about Wayne's passing. He will certainly be missed by all of your family and our community. We are extending our sincere sympathy. Our sincere sympathy to the Seiter family. Our thoughts and prayers are with you. I am so sorry for your loss and will be lifting your family in prayer to the Father who will carry you through this valley. I pray that God will surround you with His tender mercies and amazing grace. Our prayers for you and all of your family. So sorry to hear of Wayne's passing. You all are in our thoughts and prayers. So sorry to hear this. My Condolences and sincere sympathy to The Seiter family. Dear Bobbie and entire family. We are so very sorry for your loss. He was a wonderful patriarch and loving family man. May God be with you all during this most difficult time. The world just lost another great family man and great farmer!! No one was prouder of his farm and his family than Wayne Seiter!! He was a rare breed that believed that hard work never hurt anyone and that no one is entitled to more than they’re willing to work for! I see this valuable asset in each and every one of his children. I’ll miss his no nonsense, matter of fact, way of expressing himself. Very respectfully, Julie Robinson. Bobbie and family I am so sorry for your loss. Wayne was a really neat guy. You two created a wonderful family and life together. I am thankful to be a small part of your life. Bobbi and families, I am sorry for your loss. I will keep you in my thoughts and prayers. Bobbie, Pam, Penne, Paula, Patty and Robert, Wayne was a good man. I spent many meals at your kitchen table and nights at your house growing up. I always said I was his 5th daughter. Robert, I know you don't remember those times because you weren't born yet! Bobbie, you and Wayne always made me feel welcome! I always loved playing around with him especially when he acted like he was going to sit on my lap! My heart and prayers are with you all! You all have always been special to the Shaffer family! Our most sincere condolences for all of you. Wayne was blessed to have had a full life. He was so involved and appreciated. Sending love and prayers to all. Prayers of comfort during this time of loss to the entire Seiter family. We are sorry to hear of Mr. Seiters passing. missed by community and friends. Patty and Kyle- We are so sorry for your loss. Keeping you and your family in our prayers. To all the families, we know the hurt so well and our hearts are broken for you. May God be with you all now and the days weeks and months ahead. Sending our kindest thoughts at your loss. Our deepest sympathy to you Bobbi and your family. We were so sorry to hear of the lost of Wayne. Our prayers are with you all. God Bless! Bobbie and family, I am so sorry to read of Wayne's passing. May your memories bring you comfort at this difficult time. I am sad for the entire Seiter family and especially for Aunt Bobbie but I am equally moved by the outpouring of love that you are expressing for Uncle Wayne on social media. He was the hardest working man I ever met, and while I remember being intimidated by him as a boy I learned later in life firsthand the he was very kind. He took a genuine interest in what I was doing with my life and I enjoyed seeing him at the Richwood Fair and catching up before the harness races would start. His connection to the Amish community fascinated me. I have fond memories of chickens and lambs and sprinklers at the farm house. Bobbie, Pam, Penne, Paula, Patty, and Robert, et al - I love you and am sorry I can't attend but my thoughts will be with you on Monday and in the next few weeks as you mourn his passing. May the sympathies and love of family and friends give you comfort at this sad time. #51 from: Arthur F. Granlee Jr.
Our condolences to the Seiter family and especially to Kyle and Patty who were our neighbors for many years.We didn’t really know Wayne but with such a wonderful family Wayne had to be a great guy..
Our deepest sympathies to you and your family. May God's resurrection promise give you peace and comfort. We send our deepest sympathy to all of you on the loss of Wayne. Over the years, our lives have touched yours in many ways. We want you to know that we feel your loss and pray that God will see you through the days ahead without him. May your memories forever live in your hearts. Deepest sympathies to all family and friends of Wayne. Praying for all of you. We just learned of your father's passing. So sorry we can't be there in person to give our condolences. He was a very special treasure to our community and his influence is seen in his children and grandchildren. May you find peace in knowing God's healing comfort. Bobbi and family, my earliest memories of Wayne go back to when you had sheep and Steve was working at Parrott's. Wayne found out that we would be interested in raising orphan lambs. From that time forward, I think we were given the bulk of your orphan lambs. Our children waited anxiously every night during lambing season for Steve to come home from work, he just might have a baby lamb with him. Some of our fondest family memories were feeding bottles to these lambs. I distinctly remember two, Snowy and Muffin. They were all much loved. This is just another way Wayne spread joy and love in the community. Hold tight to your memories and share with one another. May God grant you peace and comfort. So sorry for your loss. Wayne had a great life and a loving family. Sending love and hugs to all. Cherish the many memories. Condolences to your family. We share your loss and cherish the memories. The entire Seiter Family I am so very sorry for your loss. My thoughts are with you during this difficult time. The family bond that you all have will help you get through. It was always nice to see Wayne around town. Dear Bobbie and Family Our deepest sympathy to you and your family.Together your will share many great memories of his love he had for all of you. Sorry for your loss. May all the memories bring comfort. #67 Private Log in to view. Wayne was one of a kind, he loved God, his family, his country and his community, someone will have to fill very big shoes. RIP Wayne. So sorry for your loss. Our thoughts and our prayers are with you. To the whole family--So Sorry for your loss. Love and prayers are with you. Cherish the memories. My thoughts go back to early childhood when Wayne and I were in the same Sunday School classes, and then on to 2 years of Catechism at the Lutheran Church. He was a year behind me in school, but the classes were small so we knew almost the whole high school. He was a busy guy even then, and liked to tease. Also, your cousin Kirk Reed is my brother-in-law. We are all blessed to have special memories of Wayne. May the Lord continue to give you his comfort and strength as well as many more great memories. So sorry to hear of Wayne's passing. I always enjoyed discussing farming and hogs at the Richwood Fair. Prayers for all the family. Wayne Seiter served as a very good board member for The Elgin School District. He cared about the kids and the community. Wayne stated his position clearly. He did not play any political or personal games in his decision making. May God be with the family during this time of grief. To Bobbie & all the Seiter family . . . Sending our sincere condolences to all of you. Wayne was one of a kind and he will be missed by friends and many in his community. So sorry for your loss.